Pearls are formed from minute calcium carbonate crystals deposited in concentric layers and are iredescent under the light. Mother of Pearl (Nacre) is formed from the inner shell of molluscs and makes up the outer coating of pearls. Black Pearl Boxed Jewellery Set. This beautifully exquisite boxed set of Pearl Jewellery contains.. Pretty decorative wear with the added bonus of beneficial properties. 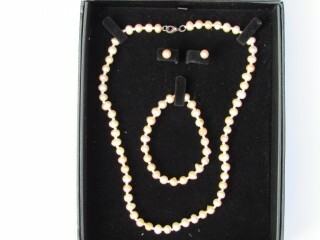 ..
Peach Pearl Boxed Jewellery Set. This beautifully exquisite boxed set of Pearl Jewellery contains..